How could a movie that included Big John Studd be bad? Pretty damn easily, I guess. 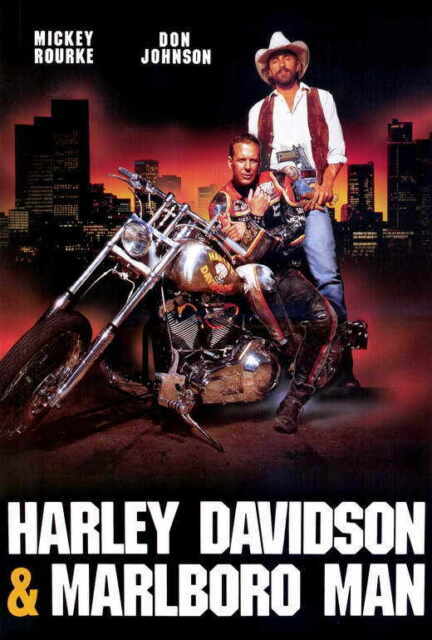 Harley Davidson & the Marlboro Man is a comedy/western/action movie featuring Don Johnson as Harley Davidson and Mickey Rourke doing his very best Bruce Willis imitation, desperately trying to keep his face from moving. Seriously, why does Mickey Rourke only have one expression in this freaking movie? He has the Bruce Willis smirk and it is on his face in every situation his character finds himself in. The writing is terrible. The story is ridiculous. I guess there are absolutely no police officers in the city (except for the one Harley slept with). The dialogue is laughable. In order to save their friends’ bar, Harley Davidson and the Marlboro decide to rob a bank truck. Unfortunately, the one bank truck they choose to rip off is loaded with drugs instead of money. So, as any good heroes would, they contact the drug dealers and offer to sell these deadly dangerous drugs (they have been told that the drugs kill 1 out of 7 people that take them) back to them for money. Hm, quite the heroic pair. But they are trying to save their friends’ bar, so all bets are off. Of course, their friends wind up dead and that sets off their eventual revenge part of the story. My brain hurts after watching this. The special effects in the third act confrontation are as bad as you are going to see. The green screen is so obvious that I cannot believe anyone would have okayed the release of the scene. Don Johnson and Mickey Rourke are good together so the film is not a total wash, but just about everything else is horrible. Oh, but WWE Hall of Famer, the late great Big John Studd is here and it is good to see him. He is decent for his short, smallish role. Otherwise, this is a stupid buddy film that cannot ride on the charisma of Don Johnson and the frozen face of Mickey Rourke for long.